Over Christmas I told my TV hard disc to copy various TV shows, while I was away seeing family, and when I do that I usually leave a bit of time before and after. 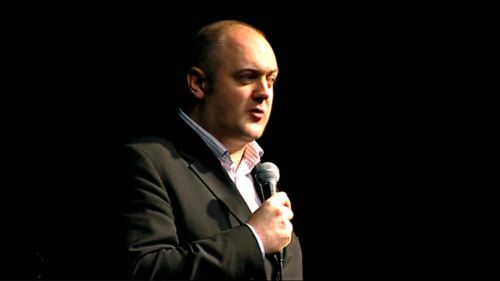 That caused me to pick up random stuff I wasn’t expecting, and I’ve only just seen some footage I thus accidentally recorded of comedian Dara O’Briain, doing stand-up at the Hammersmith Apollo. Employers will be screaming for you. “We’ve got a hole in our company the size of a man who knows German, Sociology, and History. But can he play the guitar?” ... It’s a unique set of talents my friend, and there is one job out there waiting for you, in the Goethe Institute band. Just so you know, by the way, from the rest of us here who’ve been through the whole school system and that, and have gone to the other side of the education and all the exams and all that, the stuff you’re learning day to day, all the subjects and all the quotes and all of that stuff, ... that stuff, when you get out into the real world and you’re looking for work and you’re meeting people, that stuff [heavy emphasis] ... is ... vital.